In Java, object creation is known as instantiation because an instance of a class is object. Let us explain more through Instantiate Java. In the above code, d1 is known as object of Demo class. Other way, we can say, d1 object is instantiated. In my own way, I can say, d1 is pointer to the whole class. With d1, we access the constructor and we can call variables and methods. No object like d1, the whole class like Demo is waste. 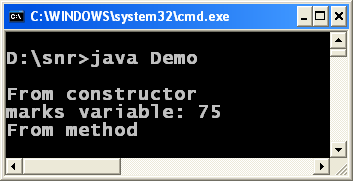 See the following program on Instantiate Java. In the above code, with object d1, constructor, method and variable are called. Think, without object d1, is it possible to call all these? No, not possible. More on object creation, the purpose of new keyword, what is Demo() is called, anonymous objects and reference variables are discussed in the following posting of this same Web site.